Even with metal-free restorations increasing in popularity, porcelain-fused-to-metal remains the restorative technique of choice for a majority of dentists, and it’s not hard to see why: PFMs are strong, esthetic, and time-tested. Ceramists at Danaren fabricate beautiful, lifelike restorations, offering superior esthetics that parallel natural tooth structures. 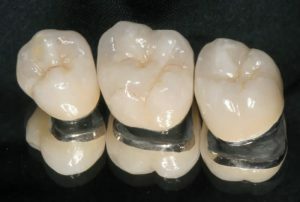 From single units to roundhouse bridges, porcelain-fused-to-metal is especially versatile. Plus, the very fine Lucite crystals in our porcelains result in a combination of high wear resistance and forgiveness to surrounding dentition. Danaren’s customer communication ensures that each case is designed exactly to your specifications, and our stringent quality control procedures guarantee that we meet or exceed your expectations each and every time.